On the lifehack scale of frugality, I’m maybe an 8 out of 10. At least for some things. Take toothpaste for example. I’ll squeeze every last drop out of it. Every time I think I’ve filled my toothbrush for the last time, I manage to find just a little more. The one problem with this is that it becomes more and more strenuous to use a tube of toothpaste as you try to maximize its value. Sometimes it takes two hands, good lighting, and my forearm (to hold the toothbrush steady) as I try to eek out the last drop. I’ve experienced something similar with Biddy’s insulin. When there’s only a few millimeters of insulin remaining in the bottle, there’s quite a bit of precision required to fill the syringe. That brings me to today’s pet please: The first time you use a brand-new instrument after finally letting go of its predecessor. 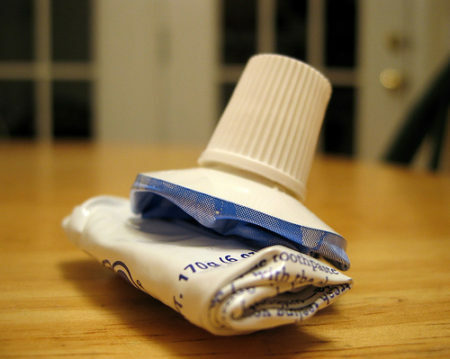 With toothpaste, it takes but the slightest pressure from two fingers to extract the paste from a full tube. With insulin, I poke the syringe into the bottle without wondering if the tip is within range of the liquid, because it’s all liquid. It’s about the contrast between scarcity and abundance, and it makes me appreciate both. This entry was posted on Sunday, January 15th, 2017 at 10:36 pm	and is filed under pet please and tagged with pet please. You can follow any responses to this entry through the RSS 2.0 feed. I always use WAYYY too much shampoo after a haircut… It’s like I forgot that I literally just lost more than half my hair 10 minutes ago. You’re right about appreciating both scarcity and abundance. My day started appreciating the abundance in my life. Moments later I was appreciating a scarce resource and recycling some cardboard.